"Flugfélag Íslands" redirects here. For an earlier airline of that name, a predecessor of Icelandair, see Icelandair § Flugfélag Íslands. Air Iceland (Icelandic: Flugfélag Íslands) is a regional airline with its head office at Reykjavík Airport in Reykjavík, Iceland. It operates scheduled services to domestic destinations across Iceland and to Greenland and the Faroe Islands (operated by Atlantic Air). Its main bases are Reykjavík Airport and Akureyri Airport. It is a subsidiary of Icelandair Group. In late 2011, Air Iceland acquired two Bombardier Dash 8-200 aircraft for delivery in early 2012. Upon delivery of these aircraft, Air Iceland sold its only Dash 8-100 series. It previously operated ATR 42 aircraft from 2000 to 2003. A fleet of 3 Bombardier Dash 8-Q400 aircraft replaced the airline's 5 Fokker F50 aircraft in 2015-16. Services using the new aircraft will include a route to Aberdeen on behalf of Icelandair started in March 2016 flying out of KEF. 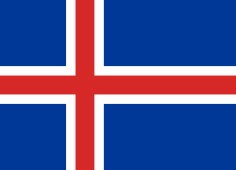 In February 2016, Air Iceland will introduce a new livery on all of its fleet, beginning with the Bombardier Q400 that will be delivered in February 2016 and then repainting the remaining 3 Bombardier Dash 8-200. Among the destinations, most in Greenland and some in Iceland have runways less than 1,100 metres (3,600 ft) length. Dash 8-200 is the only aircraft type possessed by Air Iceland compatible with such runways. The Q400s are currently used on flights to Akureyri, Egilsstaðir, Kangerlussuaq, Narsarsuaq and Aberdeen (on behalf of Icelandair). On 29 May 1947, a Air Iceland C-47A TF-ISI crashed at Héðinsfjörður, Iceland in bad weather, killing all 25 on board. This was the worst air accident in Icelandic history. On 14. April 1963 an Air Iceland Vickers Viscount TF-ISU, named Hrímfaxi crashed on visual approach to Oslo Airport, Fornebu, 10 miles off the airport in a residential area at Nesøya. All on board, eight passengers and four crew, lost their lives. No fatalities on ground. On 4 March 2011, as Dash 8 TF-JMB was landing at the Nuuk Airport it was hit by a microburst and the right wheel broke off causing the aircraft to slide off the runway. All 31 people on board were unharmed. However, the aircraft was written off. ↑ Home. Air Iceland. Retrieved on 13 February 2011. "Air Iceland - Reykjavik airport - 101 Reykjavik"
1 2 "Directory: World Airlines". Flight International. 2007-03-27. p. 58. 1 2 "Air Iceland fleet list". planespotters.net. Retrieved July 19, 2014. ↑ "Uppfletting í loftfaraskrá". Samgöngustofa. Retrieved 2016-05-19. ↑ "Íslensk vél brotlenti á flugvellinum í Nuuk - allir farþegar ómeiddir" [Icelandic aircraft crashed at the airport in Nuuk - all passengers unharme] (in Icelandic). 365. 4 March 2011.